The Supreme Court of India was inaugurated on January 28, 1950. It succeeded the Federal Court of India which was established under the Government of India Act, 1935. Article 124 to 147 in Part V of the Indian Constitution envisages the powers, independence and jurisdiction of the Supreme Court. The maximum strength of the Supreme Court can be 31 judges (one Chief Justice and 30 other judges) while currently there are just 24 judges (including Chief Justice) working in the Supreme Court and 7 posts are vacant. What is the Collegium System? The Collegium System is a system under which appointments/elevation of judges/lawyers to Supreme Court and transfers of judges of High Courts and Apex Court are decided by a forum of the Chief Justice of India and the four senior-most judges of the Supreme Court.' There is no mention of the Collegium either in the original Constitution of India or in successive amendments. The Collegiums System of appointment of judges was born through “three judges case” which interpreted constitutional articles on October 28, 1998. The recommendations of the Collegium are binding on the Central Government; if the Collegium sends the names of the judges/lawyers to the government for the second time. Figures related to Indian judiciary show that the Indian judiciary is occupied by near about 200 Indian families. Year after years the persons related to these families becomes the judge in the courts. The system through which the judges of the Supreme Court/High Courts are appointed and transferred is called “Collegium System”. The Collegium sends the recommendations of the names of lawyers or judges to the Central Government. Similarly, the Central Government also sends some of its proposed names to the Collegium. The Central Government does the fact checking and investigate the names and resends the file to the Collegium. Collegium considers the names or suggestions made by the Central Government and resends the file to the government for final approval. If the Collegium resends the same name again then the government has to give its assent to the names. But time limit is not fixed to reply. This is the reason that appointment of judges takes a long time. Here i would like to give the example of Chief Justice of the Uttrakhand High Court. In this case the Collegium is recommending the name of the Chief Justice K.M. Joseph for the judge of the Supreme Court but the central government is not giving its assent due to political reasons. It is worth to mention here that there are 395 posts of the judges are vacant in the High Courts and 7 posts in the Supreme Court. There are 146 names are pending for approval between the Supreme Court and Central Government since last two years. Out of these 146 names 36 names are pending with the Supreme Court Collegium, while 110 names are yet to be approved by the Central Government. 1. Inspite of being a democracy, the judges appoint judges in India. 2. Collegium System could not appoint judges as per the vacancies in the courts due to various reasons. 3. If the constitution makers had liked this way of appointment of judges, they would have envisaged it in the original constitution itself. 4. 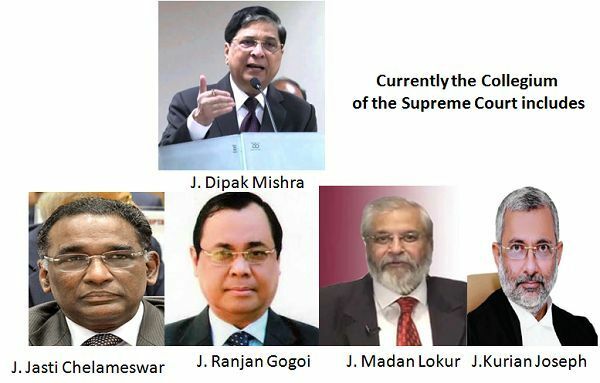 In the year 2009, Law Commission of India said that nepotism and personal patronage is prevalent in the functioning of the Collegium System. 5. Collegium System is recommending the appointment of the judges without considering the talent available in the market. Based on the complete information given above, it became clear that the current Collegium System of the country is trying to make "wrestler's son wrestler" and "judge's son judge" without giving chance to talent available in the market. So Collegium System is not a healthy practice for a democratic country like India. The Collegium System is not the constitutional system so the central government should make appropriate laws to pull out the Indian Judicial System from the monopoly of some families.